Colorado voters chose a progressive Democrat as governor but rejected a ballot proposition that would have cut down on oil and gas drilling in the state. The results highlighted an uneven night for the energy industry in statehouse elections and ballot initiatives around the country (Energywire, Nov. 6). Colorado's Jared Polis, who's served in Congress for 10 years, defeated Republican state Treasurer Walker Stapleton 51.6 percent to 45 percent in unofficial returns. He'll replace fellow Democrat John Hickenlooper, who cannot run again because of term limits. Proposition 112, which would have imposed a 2,500-foot setback between new oil and gas wells and surrounding buildings in Colorado, failed with 57.6 percent opposition. A separate Colorado ballot proposal, known as Amendment 74, that would have forced governments to compensate property owners for the cost of regulations was defeated, 53.6 percent to 46.4 percent. In Florida, a constitutional amendment to ban offshore drilling in state waters passed easily, with 68.8 percent of the vote. Republicans held onto the governor's seats in Texas, where Gov. Greg Abbott won a second term, and in Oklahoma, where businessman Kevin Stitt defeated former state Attorney General Drew Edmondson (D). But Democratic Rep. Michelle Lujan Grisham beat GOP Rep. Steve Pearce in the race to replace New Mexico's outgoing Republican Gov. Susana Martinez (see related story). In the shale-drilling Appalachian states, Democratic Gov. Tom Wolf coasted to re-election in Pennsylvania, and Republican Mike DeWine was elected to succeed outgoing Gov. John Kasich (R) in Ohio (see related story). A defining issue in Colo. In Colorado, Polis hinted at his environmental priorities in his acceptance speech. "Tonight we celebrate, and tomorrow we roll up our sleeves and get ready to work with Republicans, independents, Democrats and all Coloradans of goodwill because at the end of the day, we all believe in our children's future, we all believe in protecting our amazing parks and open space, we all believe in saving people money on health care," Polis said during remarks that were broadcast on Facebook. Energy development has been one of the defining issues of Colorado politics during Hickenlooper's tenure. The state's oil production has more than doubled in five years as the fracking boom breathed new life into old fields north of Denver. But there have been a string of clashes and lawsuits as local governments and green groups tried to prevent drilling in the state's rapidly growing communities. 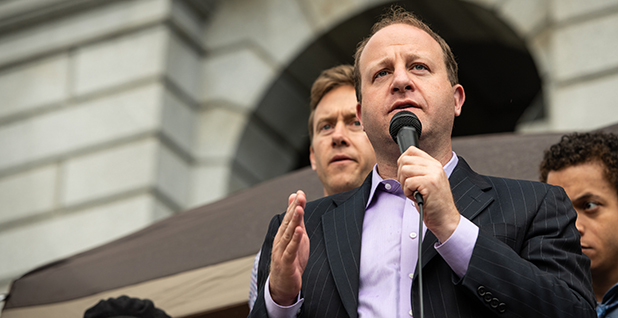 Polis has been more liberal than Hickenlooper on drilling issues, siding with homeowners and environmentalists who wanted to push oil and gas development away from populated areas. This year, though, Polis opposed Proposition 112 as too extreme. Although he's said he wants the state to transition to renewable electricity by 2040, he's also called for initiatives such as full-day kindergarten and funding for statewide water projects, which could get a boost from oil and gas taxes (Greenwire, Oct. 8). The state's oil and gas regulators said Proposition 112 would have prevented new drilling on 85 percent of nonfederal land in Colorado. Supporters said it was necessary after an oil field explosion last year leveled a home in a Denver suburb, killing two people (Greenwire, Aug. 30). The energy industry raised about $41 million to defeat the measure in Colorado, while supporters raised only $1.3 million. "We're grateful that Coloradans stood with the energy sector to oppose this measure," Dan Haley, president of the Colorado Oil and Gas Association, said in a statement. "I want every Coloradan to know that we are committed to developing our resources in a responsible manner that protects the environment and keeps our employees and communities healthy and safe." The Florida ballot initiative, Amendment 9, amended the state constitution to prohibit oil drilling in state-controlled waters. Under a quirk in Florida's legislative process, it was packaged with a constitutional amendment to extend the state's smoking ban to electronic cigarettes. There's very little oil development in Florida, and the state already has a law against offshore drilling. Supporters said the amendment was intended to send a message to the Trump administration about the possibility of opening federal waters near Florida to drilling (Energywire, Oct. 18). "Voters have made it loud and clear," Susan Glickman of the Southern Alliance for Clean Energy said in a statement. "We do not want offshore drilling anywhere near our coasts. It's just not worth the risk to our environment, our economy and our way of life here in Florida."